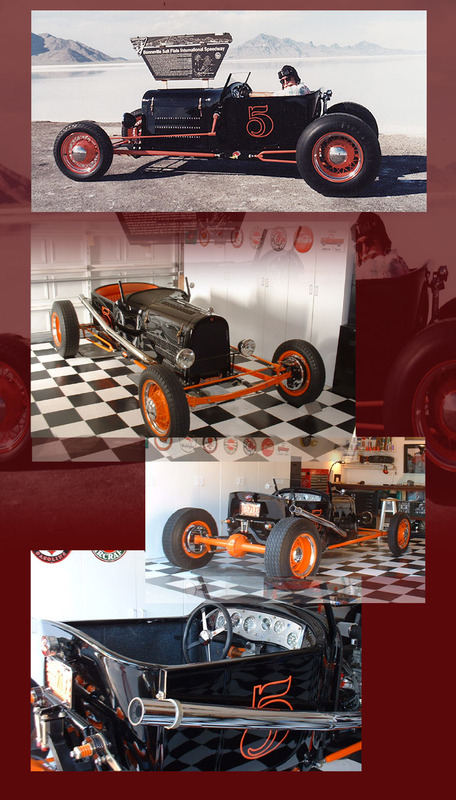 Jon Gobetti sent these photos of his hot little roadster. This indeed is a first-class job! "This is a 1920 Dodge front half of a touring body. Everything orange is powder coated. Powered by a Pontiac Iron Duke w/ a cross flow head, and fed by a single Rochester 2-barrel carb. It's backed up by a Chevy Monza 5-speed. '34 Rear 4:11 gears. '31 Ford front axle, and '40 ford juce brakes. Schroder steering, and S&W Gauges. Home made friction shocks made from valve springs capped by freeze plugs with leather biskets between the plates designed by Steve Grimes in Ohio. The best time I have ever had is driving it in the dirt... handles just like a sprint car should. However, after 250 miles on the road in this baby and it''s "Motrin Time"! You sit on two five gallon gas tanks with a cross flow tube bewtween the tanks. '35 Ford wire wheels with original Firestones I had laying around since since I was in high school."